We can make numbers say whatever we want. We see this all the time in the media, politics, and even in real estate. Sometimes it’s a matter of intentionally fudging the numbers, but other times we might be honest about sharing something but actually still get it totally wrong. Today I want to highlight a real life example how we can end up saying something totally different about the market depending on the numbers we’re looking at. Whether you’re local or not, I hope you can take something away from this post. Then for those interested we’ll dive into a big Sacramento market update. Any thoughts? I’d love to hear your take. The sales vs. list price percentage is the ratio between the sales price and whatever the most recent list price was before a property got into contract. For example, imagine a property listed at $100,000, was reduced to $98,000, and then went into contract at $98,000. The sales to list price would be 100% (98/98). If we look at this metric alone and see a county average of 100%, it looks like properties are selling for whatever they’re listed for. Woohoo, the market is hot!!! The sales to original list price ratio is the relationship between the original list price and the final sales price. For example, imagine a property listed at $100,000 but was reduced to $98,000, and then went into contract at $96,000. The sales to list price ratio would be 96% (96/100). This metric takes into account ALL price reductions, and in my mind tells a more fuller story of the market. KEY QUESTION: Which one above does your CMA report? BIG POINT: If we look at the sales price to list price ratio the market seems like it’s NOT softening. But if we take a deeper look at the sales price to ORIGINAL list price ratio, we see properties on average sold for 4% less than their original list price last month. This is definitely a more telling stat because it reminds us how many properties have been overpriced lately. Remember, there were nearly 1800 sales last month, so an average 4% decline is a big stat. But it’s easy to miss that if we don’t know what to look for and end up reporting the first stat above. DOWNLOAD 70 graphs HERE: Please download all graphs in this post (and more) here as a zip file. Use them for study, for your newsletter, or some on your blog. See my sharing policy for 5 ways to share (please don’t copy verbatim). Thanks. Quick Market Summary: The market feels like it should at this time of year. It’s taking slightly longer to sell than it was a couple of months ago, the sales to original list price ratio has been declining, and prices are softening as the hot summer fades away. This doesn’t mean the market is dull at every price range though. In fact, the bottom of the market under $300,000 is definitely more aggressive than properties above $500,000. Right now housing inventory is 11% lower than it was the same time last year and a whopping 35% lower than it was in 2014. If you remember, two years ago the market felt extremely dull and there were about 400 price reductions every day when logging in to MLS (this year price reductions are hovering around 200 tops every day (that’s for the entire MLS coverage area)). This reminds us some fall markets are softer than others. Sales volume this year has been about the same as it was last year, though it’s important to note FHA is down 6% and cash is down over 8% so far. Celebrity house flipping seminars are coming to town frequently in Sacramento, but keep in mind only 2% of all sales in the region last month were bank-owned, which reminds us low-priced fixer deals on MLS are pretty much a thing of the past. Lastly, there has been lots of talk about the market having shifted or beginning a downturn, but right now the stats look to be showing a normal seasonal slowing. We often hear things like, “the market is starting to tank”, but unless we see a real change in the stats or hear something more definitive from the real estate community about values declining, let’s be in tune with the slowing seasonal market. In case it’s useful, here is a video tutorial I did a couple of weeks ago to walk through the slowing season and what it looked like in 2005 also. The median price is 102% higher than it was in early 2012. Sales volume was up 8.5% this August compared to August 2015. There were only 4 sales under $100K last month (single family detached). Sales volume is up about 4% this year compared to last year. Housing inventory is 11% lower than the same time last year (only 1.57 months of inventory). FHA volume is down about 6% this year compared to 2015 (though they were 26% of all sales last month). Cash sales were only 14% of all sales last month. It took an average of 26 days to sell a home last month, which is 1 day less than the previous month (and 8 less days compared to last year). REOs were only 3% of all sales last month and short sales were 2.8%. The median price increased by 1% from last month, is down 3% from two months ago, and is up nearly 12% from last year at the same time. The median price is 98.5% higher than it was in early 2012. It took the same time to sell last month compared to the previous month (but 8 less days compared to August 2015). Cash sales were 15% of all sales last month. Cash sales volume is 6.4% lower this year than last year. FHA sales were 22% of all sales last month. FHA sales volume is down nearly 7% this year so far. There is 1.77 months of housing supply in the region right now, which is over 13% lower than the same time last year. The median price increased last month, but it’s down from two months ago. The median price is up nearly 9% from last year at the same time. The average sales price and average price per sq ft are both up about 8% from last year too. REOs were only 2% of all sales last month and short sales were the same. Today’s median price is 70% higher than it was in early 2012. It took 4 more days to sell a house last month than the previous month (but 6 less days than last year at the same time). Sales volume was down less than 1% in August 2016 compared to last August and is down slightly for the year about 3%. Both FHA sales were 16% and cash sales were 19% of all sales last month. There is 2.05 months of housing supply in Placer County right now, which is down nearly 13% from the same time last year. The median price declined about 1% from the previous month, but for a better context it’s up 7% from last year at the same time. The average price per sq ft was $214 last month (was $202 last year at the same time). The average sales price was $472K last month (up about 4% from last year). Bank owned sales were only 1% of all sales last month. Short sales were 2% of sales last month. 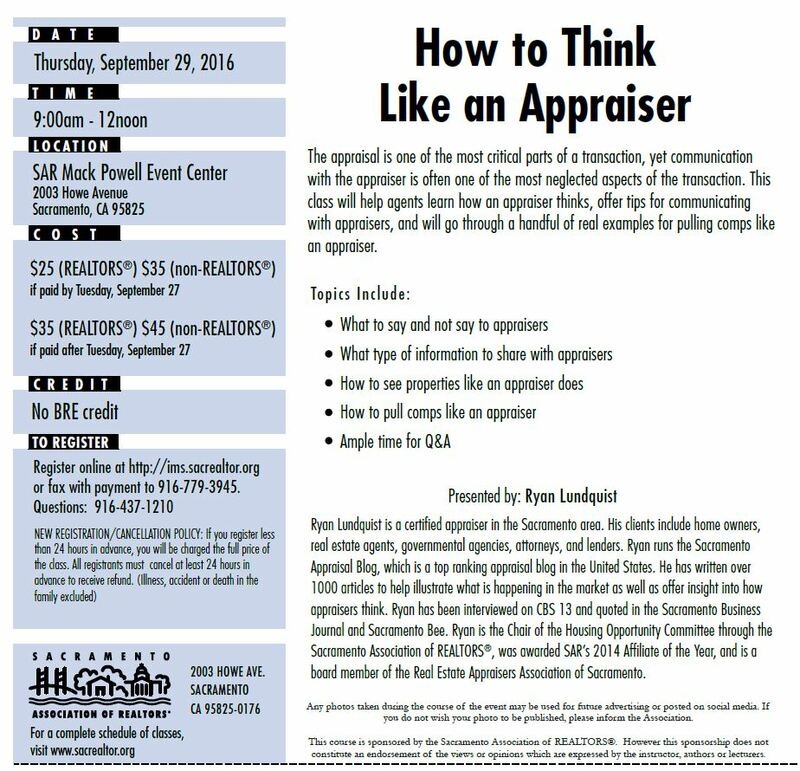 Appraisal Class I’m teaching: On September 29 from 9am-12pm I’m doing my favorite class at SAR called HOW TO THINK LIKE AN APPRAISER. This is a tremendous time where we’ll talk about seeing properties like an appraiser does. We’ll look at comp selection, using price per sq ft properly, and so many issues. My goal is to help you walk away glad you came and full of actionable ideas for business. Register here.